The winner of the 2009 SEAMEO-Jasper Research Award is Dr Rosnarizah Abdul Halim, Head of Department, Educational Leadership Assessment, Institute Aminuddin Baki, Ministry of Education, Malaysia. The 2009 Award Selection Committee declared her research work called "Innovation in Educational Management Leadership: High Impact Competency for Malaysian School Leaders" as the best study from among the eight entries. 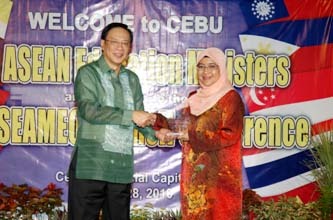 The theme for the 2009 Research Competition was "Teachers' Professional Development in Southeast Asia". Five SEAMEO Member Countries participated namely: Indonesia, Malaysia, Philippines, Singapore and Vietnam.